Continuing with the printing theme, another christmas present from ma and pa this time was for a full day screen printing on fabric course. This was at CityLit, which is a new discovery to me but has hundreds of courses, including 1 day taster sessions. Whilst this one was in Covent Garden, I am thrilled to find out there is a new arts themed base just down the road from me in Blackheath. Screen printing involves using a wooden frame covered in a fine sort of mesh. To this a stencil is applied (we used paper) and ink comes through the open area to create a print on the fabric. Multiple prints can be done at once with the same colour from same stencil but changing colour with the same stencil was tricky as the screen needed a good wash first and the paper stencil often disintegrated. Layering colour using different stencils worked, although the first layer needed to be completely dry first (a hair dryer helps here). The ink itself creates different results based on whether it’s opaque or transparent. 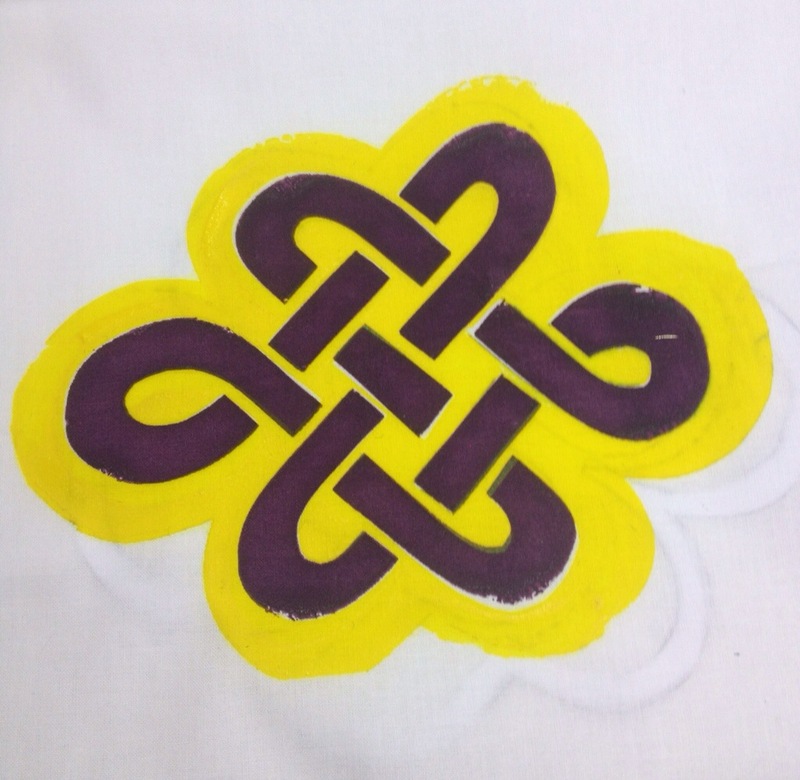 My first attempts were to print a purple celtic knot using same stencil. I then used different stencils to fill around this using yellow. 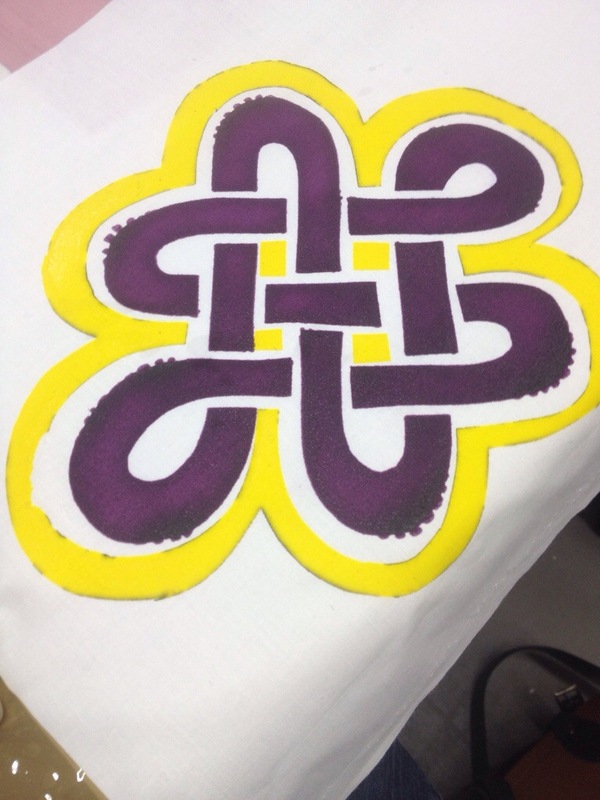 On the first I completely covered the purple design and created a yellow border using another stencil. On the second I had kept the pieces I had cut out from the first knot stencil so used these to cover the purple, leaving space for some yellow in the middle. 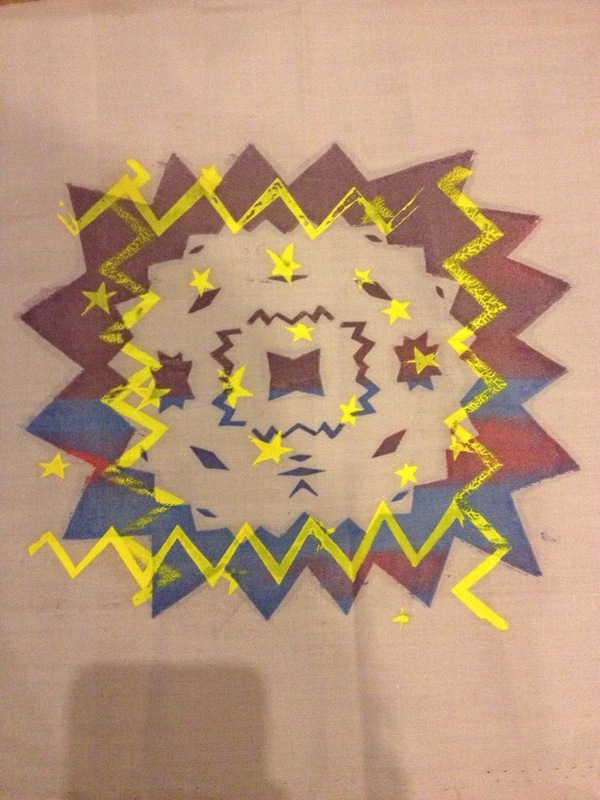 Interestingly I had used felt tip to draw the border on my stencil and this also transferred to my fabric. My last attempt was to try different stencils with different colours and just experiment. The background has a few different colour inks at once. I then overlaid this with a rotated pattern using a bright opaque yellow to really make it stand out. The colour of the fabric influences the end result too. Whilst screen printing is just a bit too messy to do at home, I can start using fabric inks on lino to create block prints which I’m looking forward to trying soon!